Before choosing a ceiling, decide what types of ceilings are and what advantages and disadvantages they have. Ceilings vary in color, material texture, construction, and geometric shape. Only the ceiling with the correctly chosen parameters will be able to visually enlarge the tiny room, add comfort to the huge hall, visually raise the low ceilings. Proper and successful design will give your home the warmth and comfort. It is difficult for the average consumer to independently understand the variety of modern materials and ceiling technology. A competent approach will avoid errors in the choice of the ceiling, taking into account the advantages and disadvantages of the ceiling. Of course, we all know the traditional ways of finishing: painting ceilings, whitewashing and wallpapering. Consider the technology of these finishing works. The most ancient, gradually losing its popularity, is considered to be a method of simple whitewashing the ceiling. 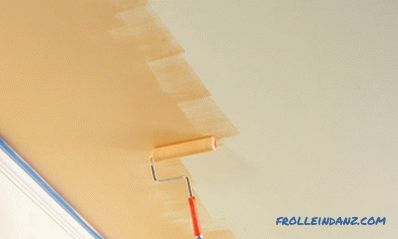 Method of implementation: using a spray sprayer or a brush, a solution of lime or chalk is applied to the ceiling. To give a beautiful shade, various dyes are added to the solution. The undoubted advantage is the simplicity of the technology. Disadvantages: it is difficult to wash off the old lime, high marketability in the performance of finishing works, high labor intensity. Do not do without prior preparation: the surface of the ceiling should be perfectly flat and clean. When redecorating, they often choose the usual inexpensive color. 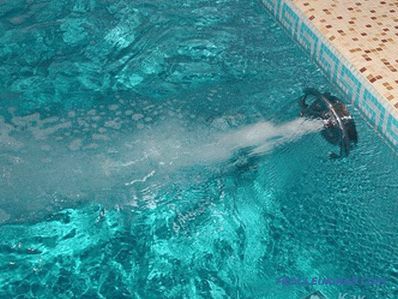 As a coating, you can use water-based or water-dispersion paints of different colors. Advantages: the simplicity of the technology for performing the work, the possibility of using expensive or cheap paints. Disadvantages: the work is more labor intensive, after 2-3 years painting needs to be repeated. Do not do without preliminary preparation: putty is applied to level the surface. Only then you can start painting. 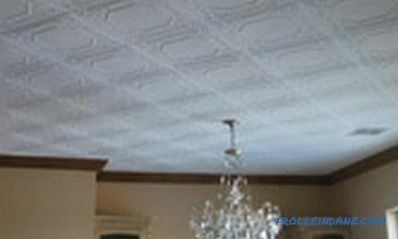 When pasting the ceiling with wallpaper, you can hide the cracks and defects in the seams on the ceiling. 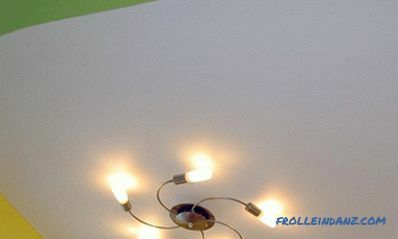 If you apply painting the ceiling, these defects will remain visible. Long term of good aesthetic appearance: more than five years. Ceiling wallpapers are denser than wall wallpapers. As a rule, they consist of glued together two layers of thick paper. Foam vinyl or beautiful embossing is applied on top. Thanks to its relief and thickness, the wallpaper perfectly hides all the irregularities and defects in the ceiling. 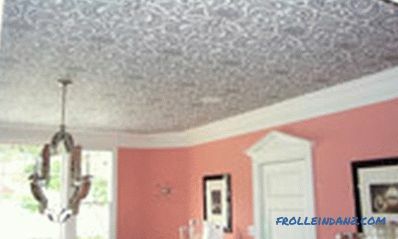 The big advantage is that when using the ceiling wallpaper is not required perfectly prepared surface. You can not wash off the old paint or bump up bumps. Everything is extremely simple and fast. 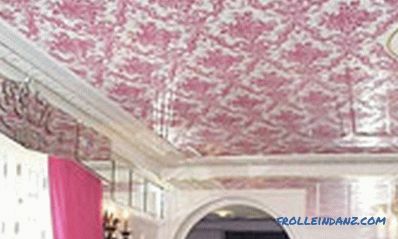 The cost of ceiling wallpaper depends on the manufacturer, the quality and popularity of the collection. 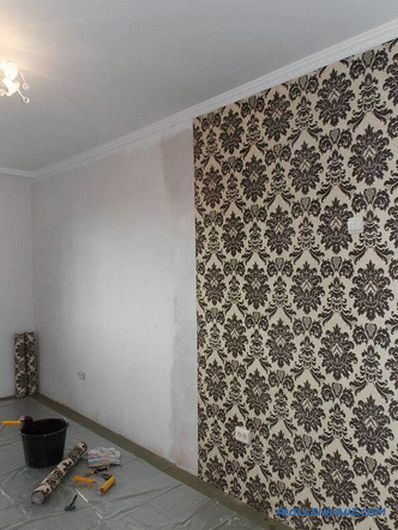 But there is a significant drawback - cheap wallpaper can not be washed. 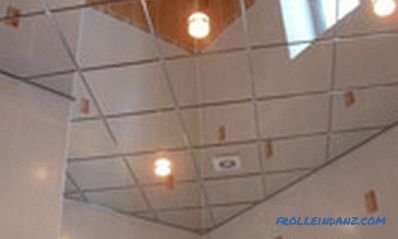 You can create beautiful glue ceilings with tiles of various sizes. The most popular size is 500x500 mm. Tiles are made of extruded polystyrene foam. 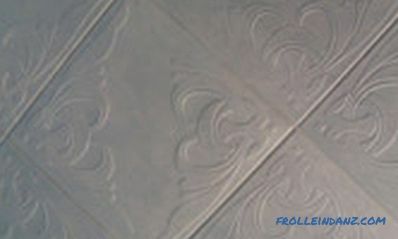 Applying tiles rectangular or square, it is possible to carry out various original patterns. 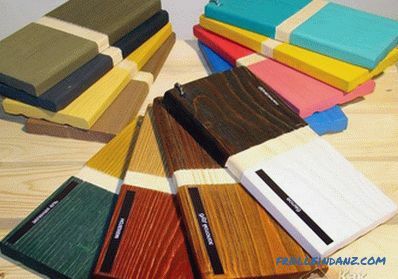 There is a large selection of adhesive tiles — smooth, rough, imitating wood carving, beautiful stucco. 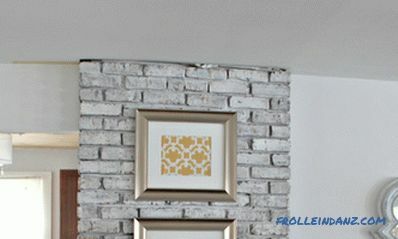 If necessary, the tile is easily painted in any desired color using water-based paint. If there is a defect between the plates in the form of a significant difference, a preliminary alignment of the ceiling surface is necessary. Very simple care: wiping with a damp cloth or perfect cleaning with warm soapy water. 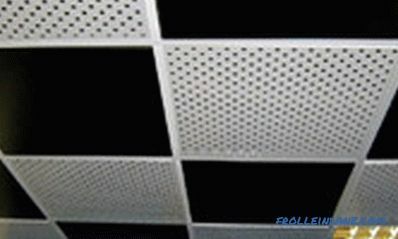 Since tile costs are low, tiled ceilings are an inexpensive way to create decorative ceilings. 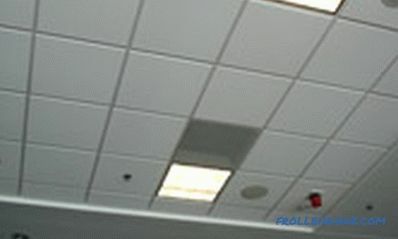 A suspended ceiling is a great option for hiding defects of the primary ceiling and various communications created. 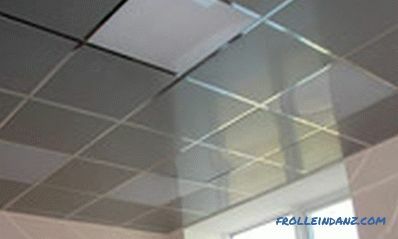 Suspended ceiling can be of any color, texture, architectural form. 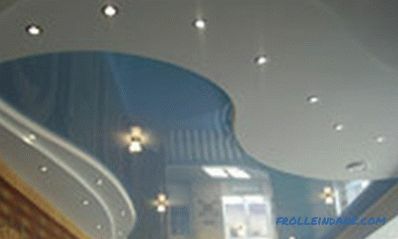 By changing the lighting design, texture, shape and configuration of the suspension elements, you can create a unique ceiling design. But first consult with experts and think through the issues of acoustics, lighting, ventilation, calculating the estimated total cost of the suspended ceiling, taking into account the selected lighting and cost of installation work. 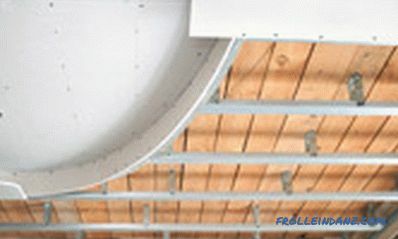 All suspended plasterboard ceilings are mounted on a galvanized steel frame. To perform complex suspended ceilings, metal frame racks can be of any shape, even curvilinear.After installation is complete, finishing of the gypsum boards is required. 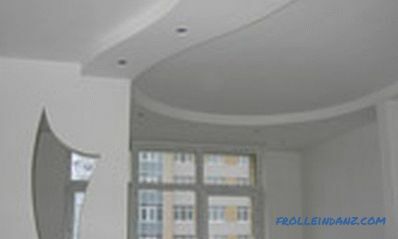 Plasterboard ceilings - a guarantee of excellent heat and sound insulation of your apartment. They are recommended to be used only in high rooms. 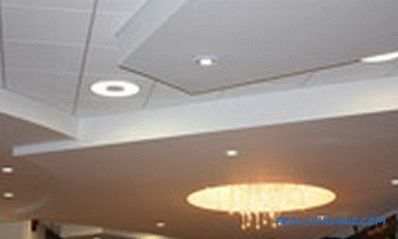 Suspended gypsum ceilings reduce the height of any room by 15-20 cm. 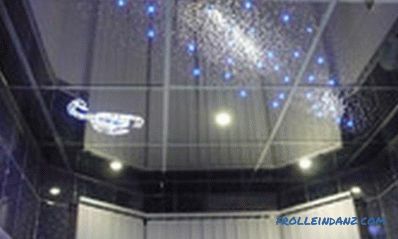 Of course, you can also create your own design of the ceiling suspension at a shorter distance. But for this it is better to use the advice of competent professionals. If drywall is wetted, it bends easily. And after drying, it can take any given shape. Therefore, it is widely used by designers to create original and complex geometric shapes: arch, dome, multi-level ceilings. Beautiful design of various configurations can be added with built-in lighting. 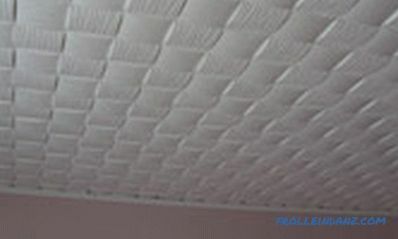 False plasterboard ceilings are cheaper than stretch ceilings, therefore they are deservedly popular. Often they are combined with tension. Multi-level plasterboard ceilings are the most expensive, most labor-intensive to install, but they allow to embody interesting modern design solutions. First, a frame construction is created. Then square cassettes are attached to it: thin aluminum or galvanized plates. A layer of powder paint of various colors can be applied on the front side of the plates. 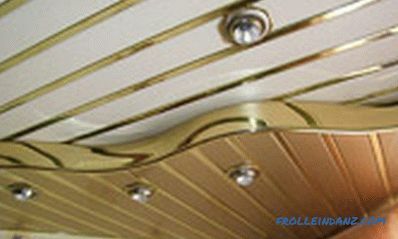 At will, it is possible to choose smooth or rough plates for registration of a ceiling. Their surface may have nicks, stripes or "worms". Among the shortcomings are the low sound and noise insulation. 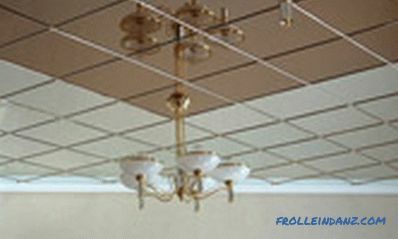 One type of cassette ceilings are beautiful mirrored ceilings. Only instead of metal panels are used mirrors. Thanks to the mirror review, you can visually increase the height, volume of the room, its area. If you install additional lamps, their light will be reflected in the original mirrors. In such a simple way you can create a truly unique and unusual lighting. 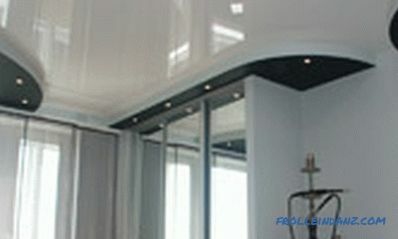 The advantages of mirrored ceilings are durable, do not accumulate statistical stress, do not corrode, are absolutely safe and environmentally friendly. Simple installation, a variety of decorative finishes made them very popular. First, the frame is made: metal or wooden. It is fixed to drywall, decorative panels, and other sheet materials. 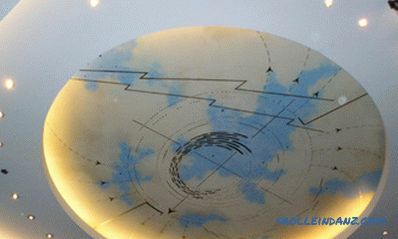 The parts of the podshivnoy ceiling flexible, so you can create any complex curved surfaces. good sound and heat insulation. Can only be used for ceilings with small irregularities (1-2 cm). Used for ceilings where communications are not planned. Built-in lights do not apply. For non-residential cold rooms and for rooms with high humidity (for example, a kitchen, bathroom) it is advisable to use slatted ceilings. They do not deteriorate when exposed to moisture, cold, from the temperature difference, therefore, they are very durable. They can even be used in rooms without heating. In addition, they are inexpensive and have fire safety. 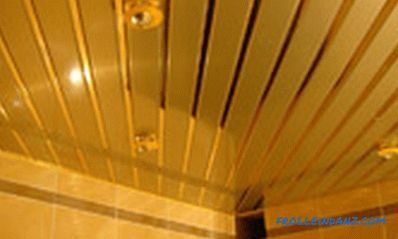 Slatted ceilings consist of special thin steel or aluminum narrow plates 0.5 mm thick. By the method of hot drying all parts are thoroughly coated with varnish. The width of the plates is 10-15 centimeters, and the length can reach 4 meters. Rack ceilings can have the most diverse colors. But the most popular is the imitation of gold-plated, silver-plated or chrome-plated surfaces. On request, slatted ceilings can be made glossy or matte. For decoration, small decorative slats are often inserted between the main elements. 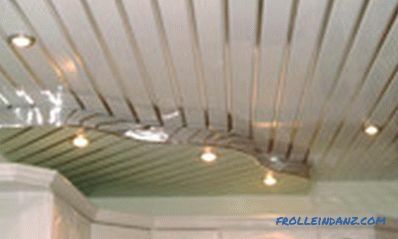 A variety of stretch ceilings are an excellent choice for finishing living spaces. It is very easy to work with them, because they consist of a solid canvas. The material are heavy-duty vinyl polymers. They are manufactured in enterprises on the basis of accurate measurements for each individual room. Their thickness is 0.17-0.22 mm. 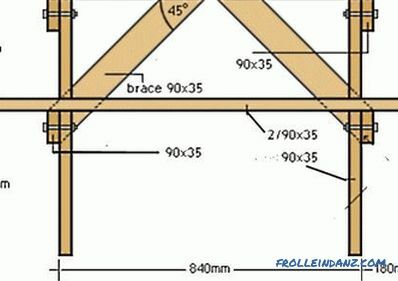 At first, a rack frame is installed around the perimeter of the room. Then a polymeric canvas is pulled over it. 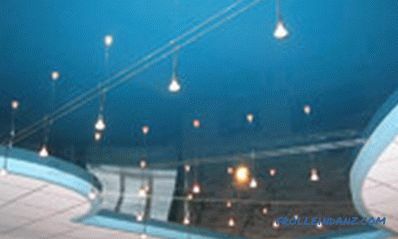 At will, on such a ceiling can be applied any pattern or pattern.Stretch ceilings withstand significant loads, have antistatic properties. Excellent aesthetic appearance (about 10-15 years). Stretch ceilings do not require special ongoing care. Can be used in wet and dry rooms. The abundance of textures and colors will allow to embody the most courageous design ideas and fantasies.